By 5 October 1917, the British attempt to push back the German line east of Ypres in a series of ‘bite and hold’ operations had met with some success. However, this had come at a great cost. While the weather held, the British had been able to bring up supplies and the all-important artillery. Artillery was the essential ingredient of the ‘bite and hold’ tactics for if the ‘creeping barrages’ could not protect the advancing British infantry they would be at the mercy of the enemy machine gunners. 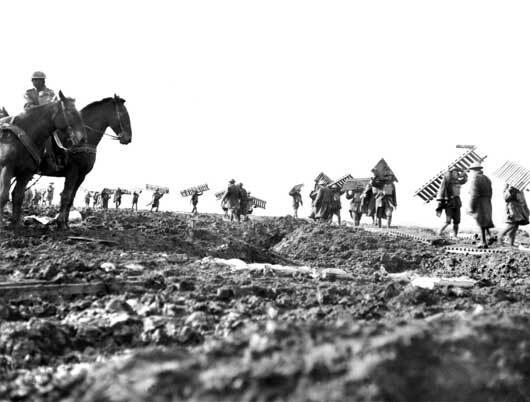 After 4 October 1917 the rain poured down and the battlefield, and all the approaches to it, became a sea of mud. To successfully bring up heavy war equipment under these conditions proved impossible. However, Field Marshal Sir Douglas Haig, the British commander-in-chief ordered the battle to continue. On 9 October 1917, British divisions, with the Australians in support, attacked in terrible conditions towards Passchendaele village. In the mud and rain the effort proved futile but the high command thought that enough ground had been gained to order a fresh assault on 12 October. Spearheading this attack were the Australian Third Division and the New Zealand Division, with the Australian Fourth Division in support. As predicted, the shells of the support bombardment mostly exploded harmlessly in the mud and little cover was available from that source. Men had to press forward in the quagmire against the German ‘pillboxes’ armed only with grenades, rifles and light machine guns. A few Australians reached the edge of Passchendaele. However, they were not strong enough to hold the ground and were eventually forced to fall back and give up their gains. Australian losses for 12 October were 3,000 casualties for the Third Division and 1,000 for the Fourth Division for no gain. 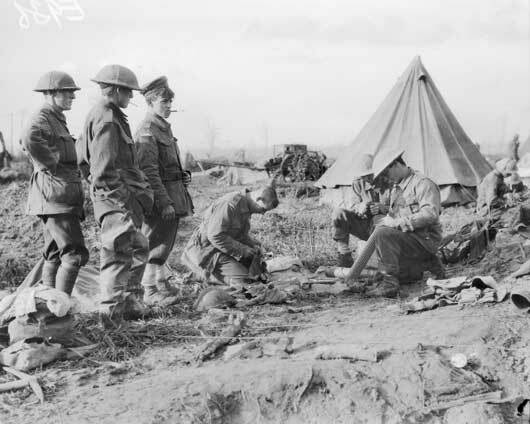 The Canadian Corps moved into the battle area on 18 October to replace the exhausted Australians. The Canadians, in five attacks between 26 October and 10 November, captured Passchendaele, and with their success the Third Battle of Ypres ended. 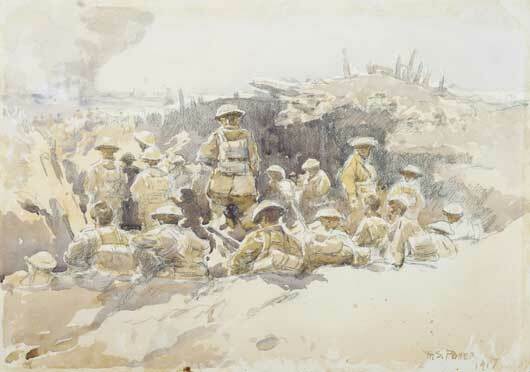 Artwork by H Septimus Power entitled 'Reserves in the trenches' (AWM ART03310). 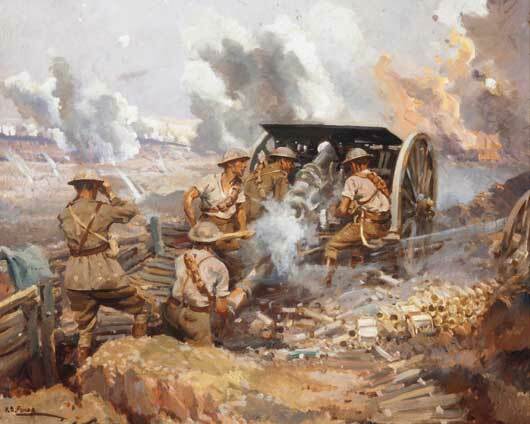 Artwork by H Septimus Power entitled 'The gunners, France' (AWM ART09100). 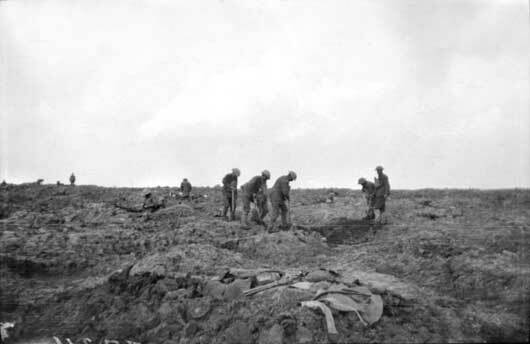 Pioneers of the 1st Division preparing a duckboard track over the muddy waste near Zonnebeke (AWM E00837). 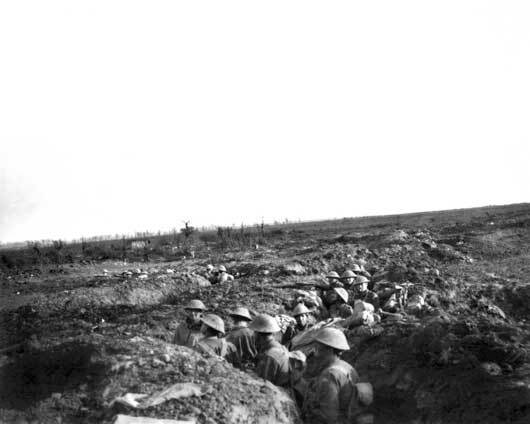 The 24th Battalion in trenches near 'Flinte Farm', with Celtic Copse visible in the background (AWM E00918). The two survivors of a 40th Battalion Lewis Gun crew cleaning their gun at Dragoon Farm, near Ypres, after the Battle of Passchendaele (AWM E00936). 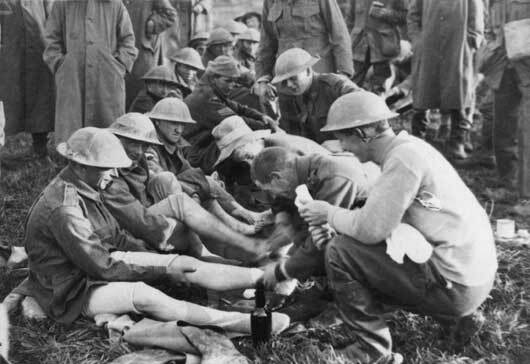 Men of the 40th Battalion having their feet attended to at Dragoon Farm, after several days' fighting in the mud at Passchendaele (AWM E00939). 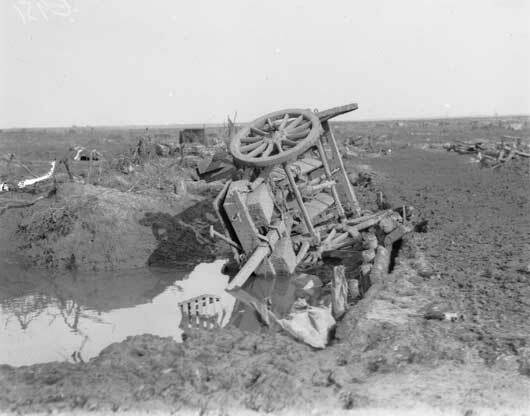 A wrecked limber, one of many similar scenes on the Ypres-Zonnebeke Road (AWM E00951). A fatigue party of English soldiers attached to the 3rd Division burying the men killed in the abortive attempt to capture Passchendaele Ridge on 12 October (AWM E01042).